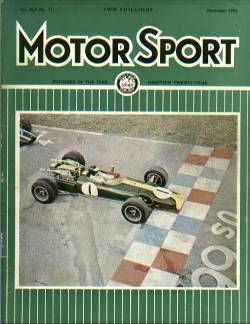 THE 1966 United States Grand Prix was set to be the biggest and best of the year. The largest purse in Grand Prix history (a total of $102,400) was unusual in that it was to be purely payment by results, the winner to receive $20,000, down to $2,800 for 20th place. The largest collection of full 3 litre cars of the year was present as the new formula was at last building up. This followed a slow start to the year when many of the competing cars were leftovers from the previous 1.5 litre formula. The race was set to be a battle of the new giants of Grand Prix racing. The BRM team had three H16 cars and a spare engine (that would be of great significance later in the weekend). Stronger steel liners replaced the original cast iron liners that had previously shattered turning lesser engine breakages into major blowups. The engines had a habit of being damaged due to balance weights breaking loose. A 2-litre BRM for Innes Ireland was a private entry by Bernard White. The local team, All American Racers had the V12 Gurney-Weslake for Dan Gurney and the old 2.7 Climax car for Bob Bondurant who was a late replacement for the hospitalised Phil Hill. The Ferrari team had one of the latest 3-valve head V12 cars for Bandini, having withdrawn their other entries. Jack Brabham and Denny Hulme had two of the 3-litre Repco V8 engined cars. Cooper used two Maserati V12s for Surtees & Rindt one with the new narrow angled valves and one of the older heads with wide angled valves. The Honda arrived with two of their powerful V12s for Ginther and Bucknum. McLaren had his car using the Ford Indianapolis V8 reduced to 3 litres from its standard 4.2 litres. Lotus looked like least prepared team or the most confused. They had three cars each with a different engine, a BRM 3 litre H16, a BRM 2 litre V8 and the Coventry-Climax 2 litre V8. Rodriquez knew he was to drive the BRM V8. Clark and Arundell knew that they had little idea as to which car they would end up with! Practice was held over a two-day period. Friday was cold and windy, with the wind dropping at the end of the session. The second practice on Saturday followed heavy rain, which dried out as the session progressed. Fridays practice started with Clark fastest at 1min 11.13sec.in the BRM H16 engined car, which was actually entered as the car for Arundell. Before halfway through practice Ginther was under 1min. 10sec. with Bandini, Surtees and Stewart. At the end of the day Bandini recorded the best time of the day at 1min. 08.67sec. followed by Surtees at 1min. 08.73sec. and 1min. 8.87sec. for Graham Hill his BRM H16. Lower down the timings, Jim Clark set 1min. 10.00sec.in the Coventry-Climax engined car and 1min. 11.13sec.in the H16 engined car. Saturday practice closed as the track dried out and times dropped. In the last minutes Brabham set a time of 1min 8.42sec. to claim pole position. The session ended with Clark in the H16 managing to record 1min. 08.53sec. to join Brabham on the front row of the grid. As Clark cruised back to the pits something went wrong with his BRM engine and, on inspection, oil was found seeping from one of the four banks of exhausts. BRMs spare mint condition engine was passed to Lotus to fit into their type 43. 1 J. Brabham Brabham-Repco V8 1 min. 08.42 sec. 2 J. Clark Lotus 43-BRM H16 1 min. 08.53 sec. 3 L. Bandini Ferrari V12 1 min. 08.57 sec. 4 J. Surtees Cooper-Maserati V12 1 min. 08.73 sec. 5 G. Hill BRM H16 1 min. 08.87 sec. 6 J.Stewart BRM H16 1 min. 09.17 sec. 7 D. Hulme Brabham-Repco V8 1 min. 09.28 sec. 8 R. Ginther Honda V12 1 min. 09.37 sec. 9 J. Rindt Cooper-Maserati V12 1 min. 09.63 sec. 10 P. Rodriguez Lotus 33-B.R.M. V8 1 min. 10.40 sec. 12 M. Spence Lotus 25-B.R.M. V8 1 min. 10.73 sec. 13 J. Siffert Cooper-Maserati V12 1 min. 10.97 sec. 15 J. Bonnier Cooper-Maserati V12 1 min. 11.40sec. 16 R. Bondurant Eagle-Climax 4-cyl 1 min. 12.40sec. 17 I. Ireland BRM V8 1 min. 12.63 sec. 18 R. Bucknum Honda V12 1 min. 12.70 sec. 19 P. Arundell Lotus 33-Climax V8 No time set. From the start Bandini took the lead and at the end of the first lap the order was Bandini(Ferrari), Clark(Lotus-BRM), Ginther(Honda), Brabham(Brabham-Repco), Surtees(Cooper-Maserati) and Stewart(BRM). The rest followed - Hill, Hulme, Rindt, Siffert, Spence, Rodriguez, Bondurant, Gurney, Ireland, Bonnier and Bucknum, Arundell (who started from the back of the grid as he never got a chance to qualify in the Lotus-33!) and McLaren. By the tenth lap Brabham was in the lead (the quiet and cunning old man of racing again where he had spent most of the year) ahead of Bandini (the bold and improving new Ferrari team leader), Surtees (the Ferrari ex-team leader, no doubt keen to put his Maserati engined car ahead of the car of his previous employer) and Clark (perhaps wondering how long his H16 engine would last). The first four had broken away from Stewart (BRM), Hill (BRM), Hulme (Brabham-Repco) and Rindt (Cooper-Maserati). Ginthers Honda was slipping back badly with gearbox problems. A key event of the race occurred as the leaders began to lap the tail-enders. Brabham and Bandini, passed Arundell(Lotus) cleanly, but Surtees had to make a couple of stabs at passing. The skirmish ended with both Surtees and Arundell spinning off the track. They both managed to return to the pits and after safety checks Surtees restarted in 13th position, three laps behind. Bandini lost the lead on the 35th lap with a major Ferrari engine blow-up. This left Brabham with a fair lead over Clarks Lotus-BRM H16 and then a distant Stewart in the BRM H16. At this stage Surtees had passed, and pulled away from the leaders setting new lap records. Half distance saw a spate of retirements. On the 53rd lap Hill, after earlier gearbox problems, retired with a broken crown wheel and pinion. On lap 54 Stewart came to a halt leaking oil and water due to a suspected shattered cylinder liner. On lap 55 Brabham came into the pits to retire from the lead with a broken camshaft in his Repco engine. On lap 58 Bucknum Honda V12 was retired due to burnt exhausts and consequent engine problems. This left Clark with a large lead, his H16 BRM engine running perfectly (so far!). The rest of the field was well strung out with Rindt second, not quite a lap behind, followed by Siffert and McLaren a lap down. Shortly afterwards Surtees passed Clark and Rindt, bringing him just one lap behind the two leaders. After the retirement of a number of the main contenders the race then settled down to a test of stamina. It is important to remember that 1966 was the first year of the 3-litre formula and most engines were untried and complex. Unlike current F1 the cars these had to be nursed to the finishing flag, those who drove at 100% all the way greatly increased the chance of mechanical failure. Clark took the flag for the BRM H16 with an even greater lead as second place Rindt ran out of fuel on the last lap. As Rindt's time of 2min. 28.5sec. for the lap was too slow to be classified, the BRM engined car was at least a lap ahead of all the other runners. 1st J. Clark (Lotus 43-B.R.M. H16)........2hrs. 09 min. 40.1 sec. Fastest lap: J. Surtees (Cooper-Maserati V12), 1 min. 9.67 sec. So the BRM H16 engine scored a dominant victory, a lap ahead of the field with many of the favoured runners fallen by the wayside. The victorious engine was in the back of a Lotus 43 but the power plant had answered its critics. The BRM team were only robbed of their own H16 victory in the 1967 Belgian GP by gear selection problems that relegated Jackie Stewart to a second place finish. In the recent era it was normal practice to fit new engines for each race. If BRM had enough engines and mechanics to fit a fresh unit to every car for every race (as happened to Clarks Lotus 43 for this race) would we now be counting the wins in dozens?